Movie review: Disney's Planes (2013) - Jen's Movie Reviews! Back in 2006, when Disney/Pixar released the movie, Cars, I had absolutely no interest in seeing it. Although I enjoy Disney movies, I just didn’t think that a movie about car racing had anything in it for me. Years later, when I finally popped the Cars movie into my DVD player, I was pleasantly surprised. In 2011, I enjoyed Cars 2 almost as much as Cars, and so when Disney decided to release a spin-off, Planes, “from above the world of Cars,” I gave it a chance. 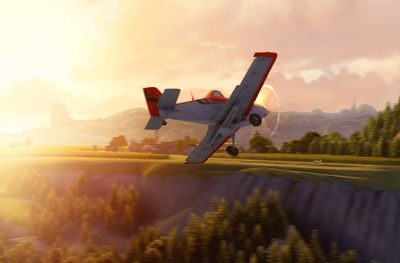 Planes follows a crop duster, Dusty Crophopper, who spends his days spreading stinky fertilizer over fields in a bucolic farm town, but dreams of being a race plane in the Wings of the Globe competition. Rather than just dream, Dusty tries out for the race. Unbelievably, he qualifies. With help from his friends: a forklift, a fuel truck, and a curmudgeonly old naval plane, Dusty sets off on a race around the world. The movie feels uncannily similar to Cars, but is engaging, thanks to quirky characters and Dusty’s heart. It helps that the movie is visually stunning, from the beautiful farmlands of Dusty’s hometown to the gorgeous landscapes of India, China, and Mexico. Planes’ theme song is inspiring enough to feel like it would fit into the score of the Disney theme park rides, Soarin’ and Soarin’ Over California. I saw Planes in 3D, although it isn’t essential to enjoy this film. If there is a weak point to the film, it is the jokes, that often aren’t very funny, and its reliance on cultural stereotypes. 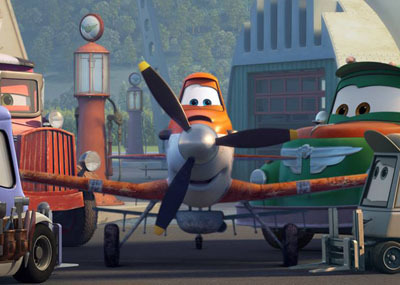 Like in Cars, the Planes animators and voice actors give a personality and a soul to each of the airplanes. Dusty, voiced by Dane Cook, is a genuine good guy… I mean, plane. Mysterious naval plane, Skipper (Stacy Keach), is intriguing. Beautiful Ishani (Priyanka Chopra) has a delightful sweetness. Dusty’s hero-turned-antagonist, Ripslinger (Roger Craig Smith), gives the right amount of tension to the story. El Chupacabra (Carlos Alazraqui) provides comic relief with his delivery and just enough vulnerability to add some dimension to his character. In a fun nod to the movie, Top Gun, two of the military planes, Echo and Bravo, are voiced by Anthony Edwards and Val Kilmer respectively. Dusty’s journey around the world proves eye-opening and dangerous, and he is forced to face his greatest fear: a fear of heights (anything over 1,000 feet)! I won’t tell you how the race ends, but I will tell you that Disney’s Planes was initially conceived as a direct-to-video offering. In fact, Planes was created at DisneyToon Studios rather than Walt Disney Animation Studios, and Pixar wasn’t involved in Planes’ production. At some point during the movie's production, it was decided to premiere it on the big screen. That is a good thing. If Planes had bypassed theaters, it would have been a shame; the movie is way too good. And on the big screen, Planes soars! Disney's Planes opened in theaters on August 9, 2013. * Jen attended an advance screening of Planes as a guest.